I’ve had a love/hate relationship with this rocking chair for a long time. When I bought it in 1988, it matched the other dark wood furniture I had at the time. I bought it specifically to use as a rocker in our family room when Gloria was born. For that reason, I’ve always loved it. But, it hasn’t matched anything in my house for years. I held off painting it for sentimental reasons, I suppose until one day, Gloria said, this rocking chair really needs a makeover. Ok! 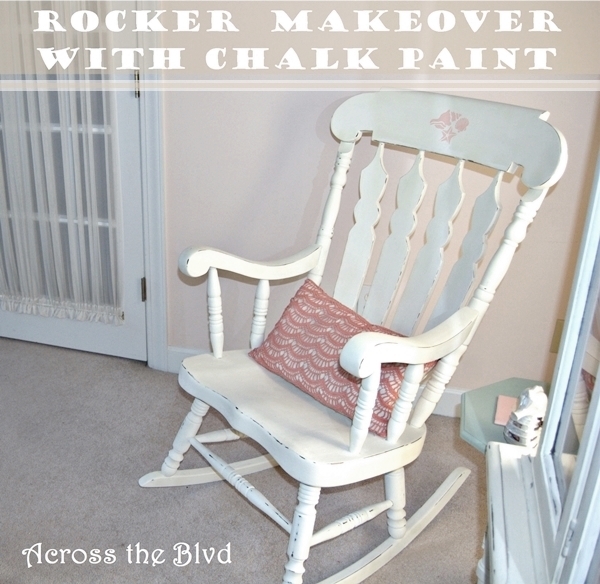 It was time for a rocking chair makeover! This is how it looked prior to its makeover. It’s dark, old and tired. Check out those details on the top of it! Lovely, yes? Not so much. I took the chair outdoors, wiped it down with TSP and got to work. I used Annie Sloan Old White Chalk Paint for this. I managed to get two coats on just before the rain started. Moving it inside, I spread out plastic on the floor and did a few touch up spots with a very small brush. Typical of a summer storm in Charleston, it blew over pretty quickly so that I could take the chair back outside to distress it. I used my palm detail sander to give it the look I wanted. I was happy to find this stencil pattern of shells at Michaels. It says it will cling to a surface, but I didn’t want to take any chances, so I used painter’s tape to hold it in place. 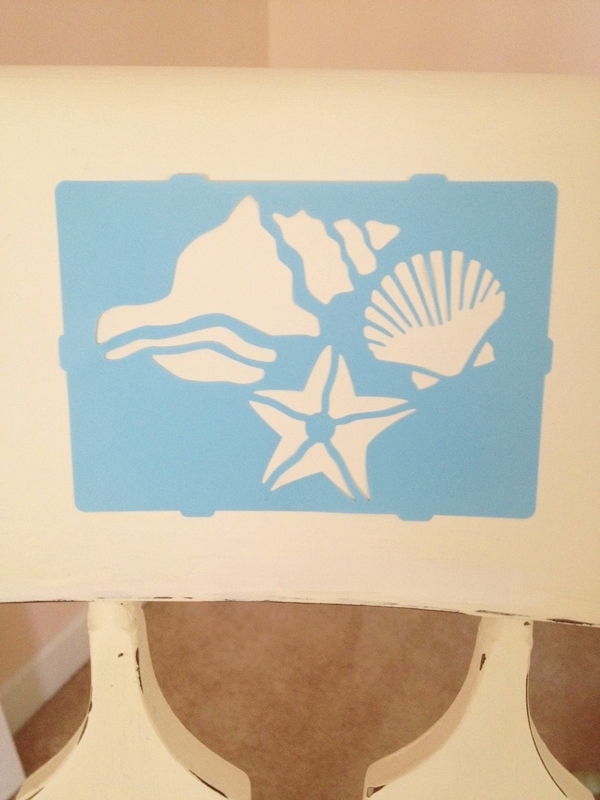 This is the same stencil I used for my coastal coasters. 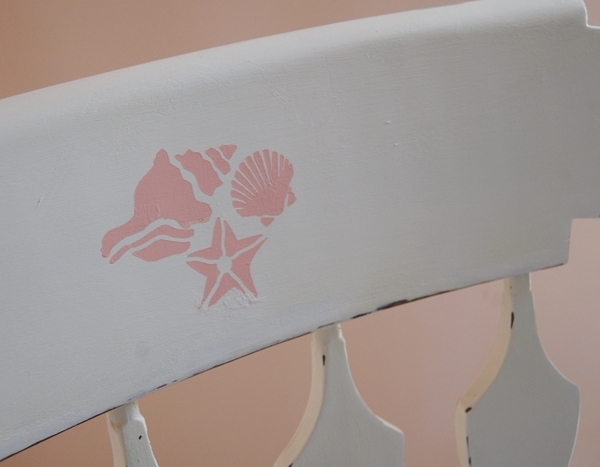 I used Craft Smart Chalk Paint in Deep Peach to paint it. I love the pop of color this gives to the chair. Once all the paint was dry, I used a synthetic brush to apply a coat of Minwax Polycrylic and cheese cloth to wipe it off. I’ve done a lot of research on wax vs polycrylic and I’ve decided that polycrylic is the way to go for me. Others disagree and think waxing is the way to go. I found a great resource about it on Painted Vintage. Check that blog out for tons of information. 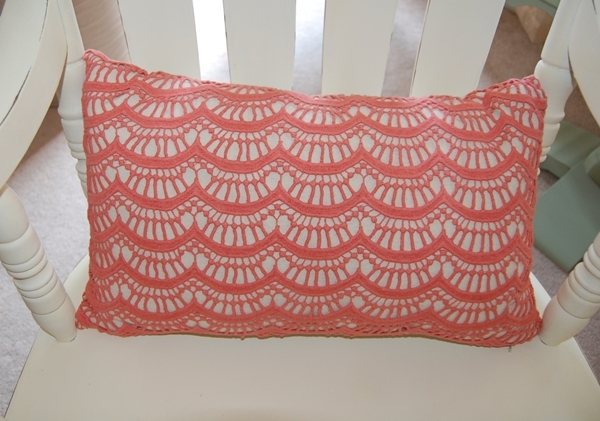 Adding a peach/coral colored pillow helps give it some color, too. I found this on sale at Stein Mart. I have to say that while I was giving this chair its makeover, I spent some time recalling those precious memories of rocking my little baby girl in it. Yes, almost twenty-seven years later, those memories are easily recalled. Now that I’ve finished the makeover, the chair truly does feel like it has been given new life. It’s bright and coastal and fits in perfectly with my Charleston Room decor now. If you look at the right side of this picture, you can see a sneak peek at the china hutch that I’ve transformed. Post coming soon on that project. 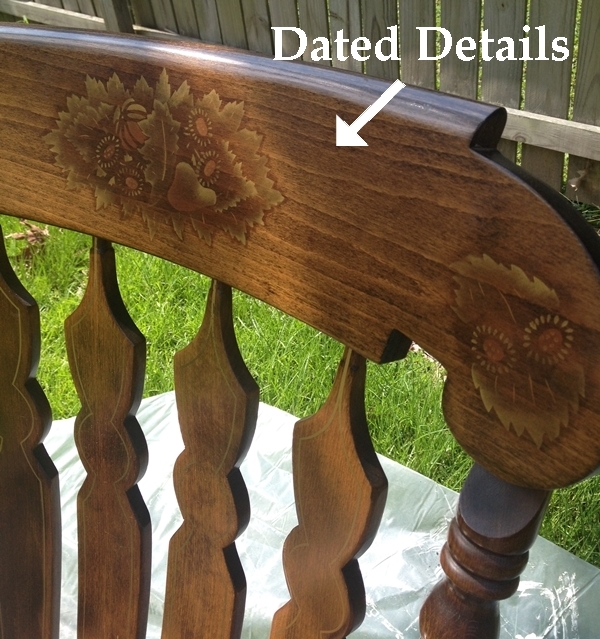 Do you have old pieces of furniture that hold memories for you? How do you feel about changing the appearance? 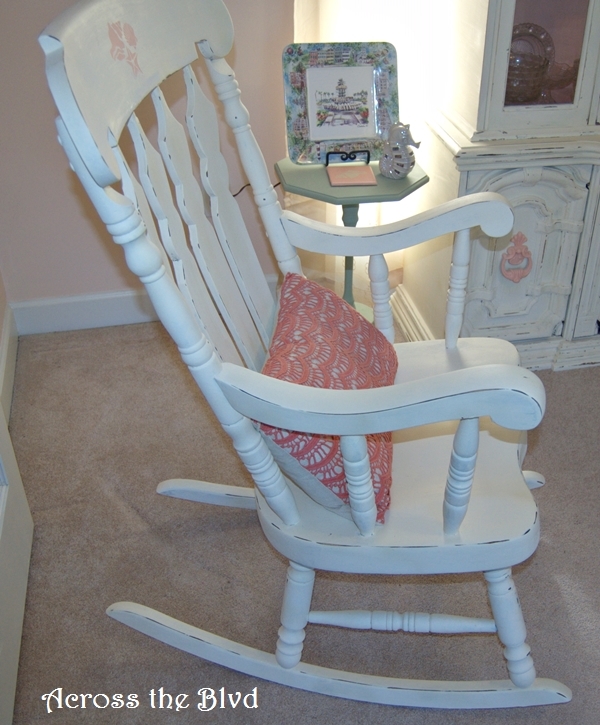 I could not be happier with how this rocking chair makeover turned out. And the memories are still in tact! Great transformation!! Thanks so much for stopping by!! Thanks, Debbie. 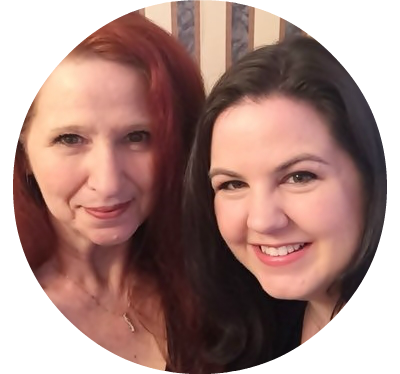 It’s always fun to visit you blog and see what you’ve been up to! 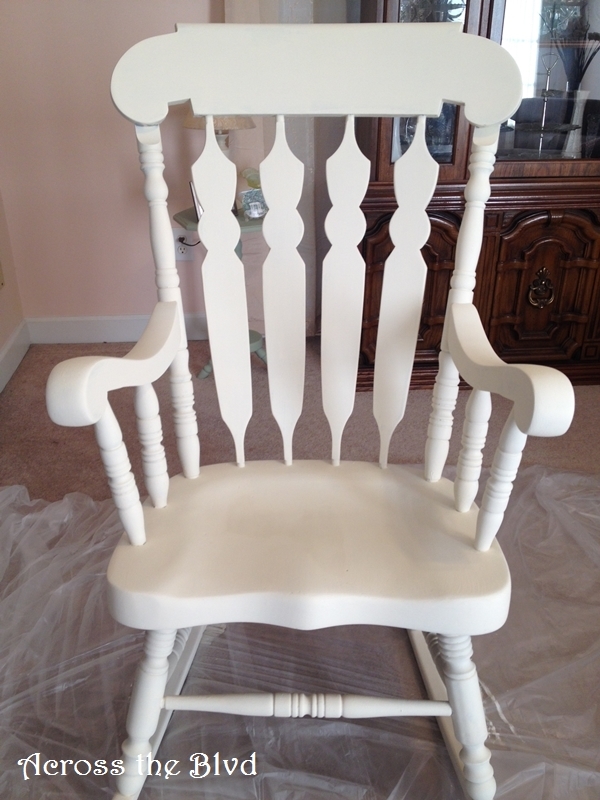 Fantastic job on the rocking chair! It really looks great and I love the pillow too. Can’t wait to see your post on the China hutch! I love what you did with the handles! Thank you! That’s so true. 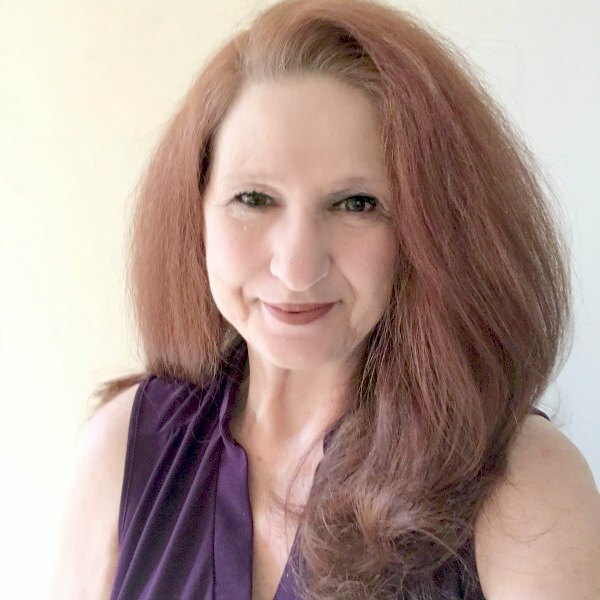 I had been reluctant to change it, but given that Gloria was the first to say that’s what it needed, I was ready to give it this new look. The china hutch is my favorite makeover ever! It has a sentimental story to go along with it, too. Thanks so much! I think the sea shells really add a lot to it. They definitely look better than those flowers that were on it originally! Very nice makeover! So much better than the brown. Thank you so much for linking up to Merry Monday this week! 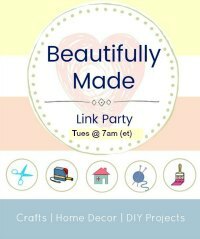 I am sharing your post today on my G+ We hope to see you next week for another great party! Have a great week! Thanks, Kim! That brown was so drab and outdated. I’m happy to share on Merry Monday. Thanks for sharing on G+. This turned out so cute! I love the pops of coral. It makes it look like a rocker you’d want to sit in on your porch at the beach! Thanks so much, Meredith! That’s just the look I was going for. Even though I’m about 30 minutes from the beach, I want that coastal feeling. Thanks for visiting! You did a fantastic job, Beverly! I love the coastal touches! Pretty! Thank you, Christine! It was looking kind of plain without those touches. Using stencils makes it so easy. Thanks for stopping by. 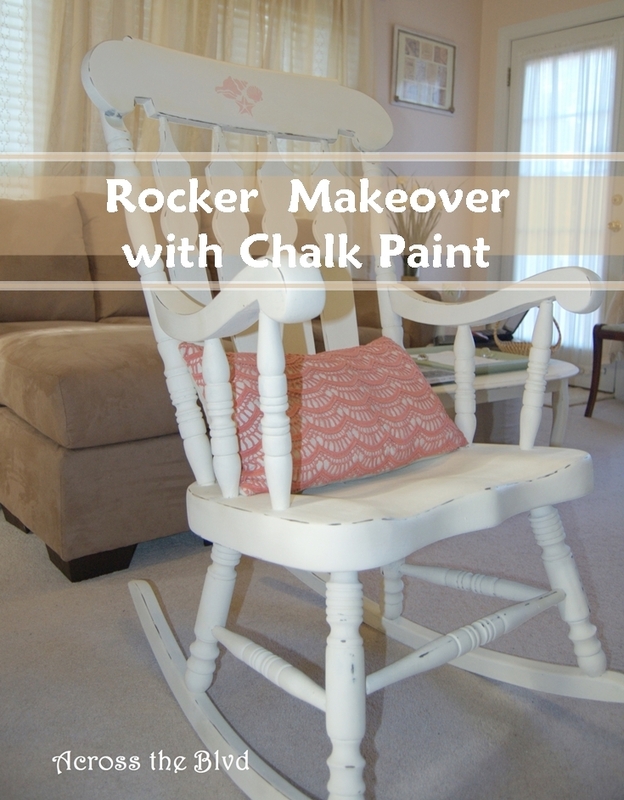 Popping over again to thank you for linking up your wonderful rocking chair makeover at the Brag About It link party! Appreciate that you take the time to share your projects with us! I’m always happy to share at Brag About It. Thanks for hosting each week! I’m trying to figure out why your posts are all going into the Spam file lately and need to be taken out and approved each time. Weird, especially considering you are the best commenter I have! 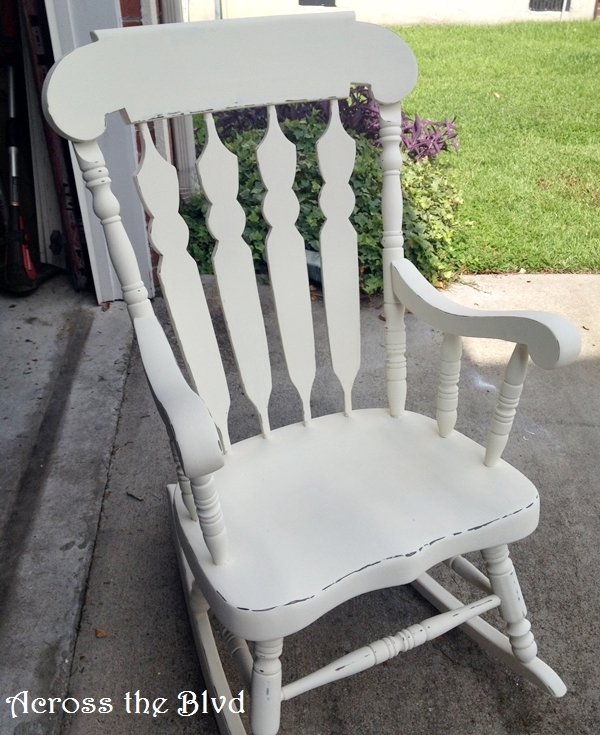 Love the sweet memory attached to your rocking chair ~ looks wonderful now that it’s distressed white with the pop of pillow color. Nice! It was nice to recall those memories while I gave the chair its makeover. Thanks so much and thanks for visiting! OK, I am so in love with this rocking chair!!! I love what you did with it, but I am dying to see that hutch!!! 🙂 I have a desk that belonged to my grandmother that I inherited. I loved it, but hated it at the same time due to it’s dark wood appearance. Then I gave it a makeover with paint. I love that I can now enjoy it with its updated look, and it looks great in my room. I’m glad you can do the same with your chair. Thanks, Christi! I hope to have the hutch project up next week. That’s so great that you could transform your grandmother’s desk to make it fit in with your decor! What a pretty makeover, I love the coastal vibe! Thanks for sharing at What’d You Do This Weekend?! Thank you, Joy! I’m always happy to share at What’d You Do This Weekend. Thank you for stopping by! 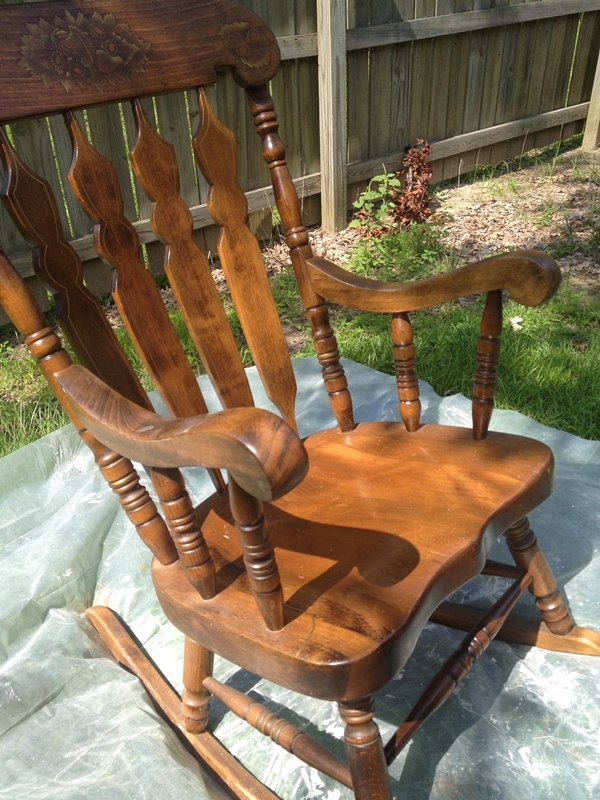 The rocking chair looks totally new and totally different. I love it ! Thank you, Winnie! 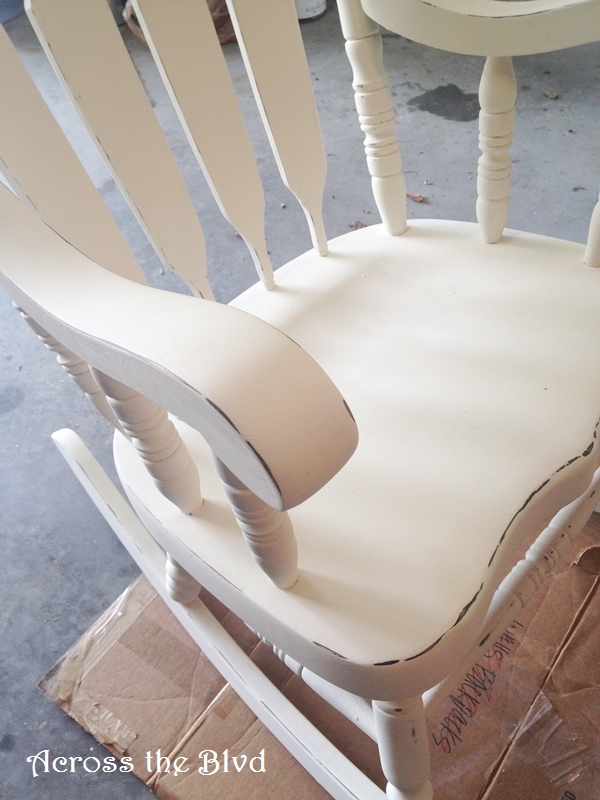 One of the best things about using chalk paint is that it is so forgiving. Mistakes can be quickly corrected with it! Thanks for visiting! Thanks, Millie. I’m enjoying its new look. Chalk paint is awesome! I just love the natural warm wood but your transformed chair looks so good in the room setting with the other furniture. Thank you, Kathleen. It does fit in with my decor in this room much better now. 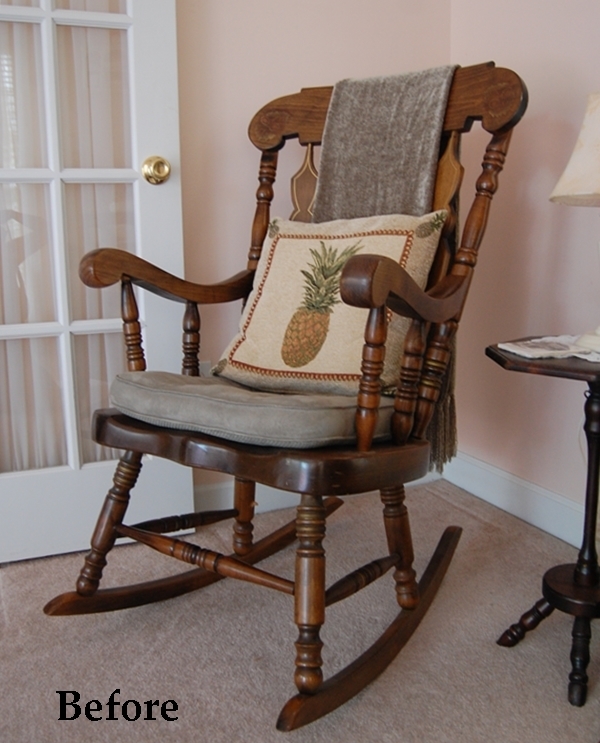 Your rocking chair makeover looks wonderful with your décor. You did a fabulous job refinishing it! I love rocking chairs! My dad gave my sister and I rocking chairs when we were little and I have been rocking ever since! Thank you, Gail! It’s so great to hold on to those kinds of treasures. Beverly, I love the new look of the chair! And it goes so well with your decor! Not only did it keep its previous memories, but it is ready for a new season of memories, as well! Almost all of the furniture in my house is Early American cherry and though it is beautiful, I’m itching to lighten it up. I have one huge obstacle, however — my husband! 🙂 Oh well, guess that’s what the thrift stores are for when I get into a mood to paint. Thanks! I’m pretty pleased with how it turned out. I’m lucky that my husband doesn’t care too much about decor or furniture color in most of our homes. I do keep our bedroom furniture dark and it’s done is a southwestern American motif. That seems to make him happy! Call me crazy but I absolutely love the look of painted furniture. Some people think painting wood should be outlawed but not me. I also love how you distressed the rocking chair. I have a crib that my first daughter used. She turns 27 this May. My second and third daughters also used the crib. Then my sister borrowed it for her youngest daughter. Even two of my grandchildren had a turn. Unfortunately, that’s where it ends. My newest grandson can’t use it because it doesn’t meet today’s safety standards. (the side goes up and down.) Too bad. I’ve often admired painted furniture, but until last year I was reluctant to do it myself. Now, I love it! I’m in the process right now of re-doing a guest room and there’s lots of painted furniture involved! That’s a shame that the crib can’t be used any longer, but it sounds like it got lots of love over the years.